Scribbled Slate: Browser War : What say you? Browser War : What say you? 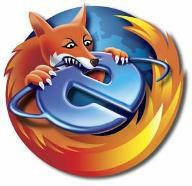 With both Firefox 2.0 and IE7 gone gold, the browser war has just become more interesting. Having used both of them since their early betas, I must admit there is no clear winner. It all depends on how each of them stacks up to your daily needs. Before I go about putting my personal verdict out there, I must confess I am guilty of one sin : Cherish the underdog status. Thats what lead me to embrace Firefox in its early days. But make no mistake, Firefox is an underdog no more(at least in its feature set). It is in fact IE, that has been trying to catch up with Firefox since 1.5 was out. This list is by no means a reflection on the complete feature set, its just about WHAT I LIKE....and you guessed it right : Go for Firefox baby !! - IE required two restarts(had RC build) to install and had a larger EXE. Though it is a one time thing, it turned me off a little bit. To end, Firefox is not without its share of problems, which i might detail later. In all fairness to IE, i like quite a bit of its features,especially the quick tabs. The debate as to which is a better browser will go on until something new comes around, but as far as i can see the true winner is really the user.